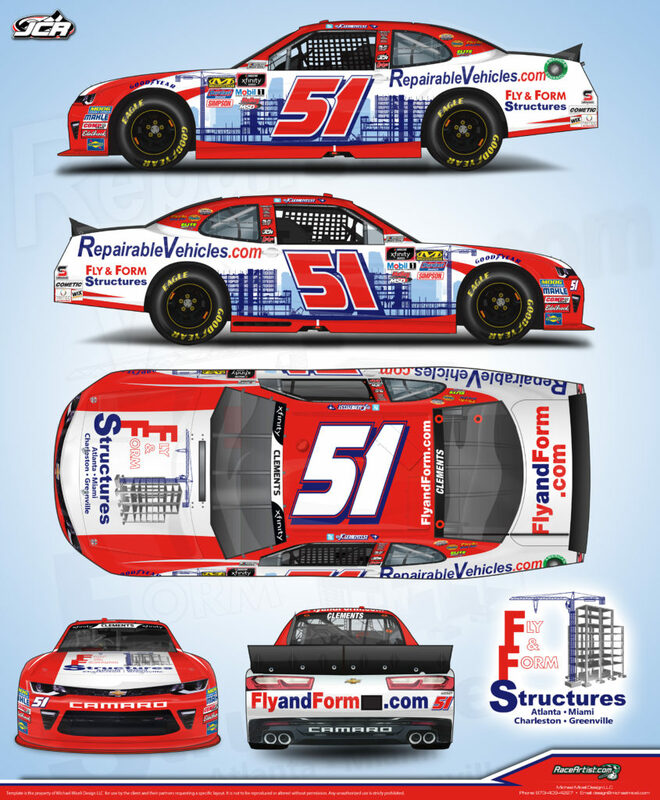 Spartanburg, SC – JCR is pleased to announce that Fly & Form Structures will be the driving support in powering the #51 Chevrolet as primary sponsor for the Ford EcoBoost 300 in the season finale at Homestead later this month. “Wow, the season has really flown by! Weren’t we just in Daytona?” said Clements. “What better way to close out 2018, but with debuting a new sponsor Fly & Form Structures,” stated Clements. “We have had a pretty good year so far and would like to cement 2018 with a win at Homestead with the great people from Fly & Form on hand and look to continue our relationship in 2019.” Clements went on to say. Joining Fly and Form will be JCR’s longtime partners RepairableVehicles.com and associate sponsors Elite Towing, The Circle Body Shop, Flounder Fish Camp, Carolina Driveline and Tritec Motorsports. • Jeremy made his debut at Homestead in 2007. • The EcoBoost300 will mark Jeremy’s 11th NASCAR XFINITY Series start at Homestead. • Jeremy’s best Homestead finish of 13th came in 2014. A division of Interstate Auto Center, Inc., RepairableVehicles.com is One of the leading resellers of repairable vehicles in North America. By working together with insurance companies, dealerships, rental companies, and automotive salvage auctions, they can provide an ever-changing inventory of high-quality total-loss recovered theft, collision damage, and other types of repairable vehicles to our customers worldwide. Visit www.RepairableVehicles.com for more information.